Throughout the ages, Jews have been intimately connected to the natural world. At Camp Ramah, Al Hagova (camp’s outdoor education program) seeks to continue this long standing relationship by offering fun and unique educational experiences that interconnect Judaism, the environment, and outdoor adventure. 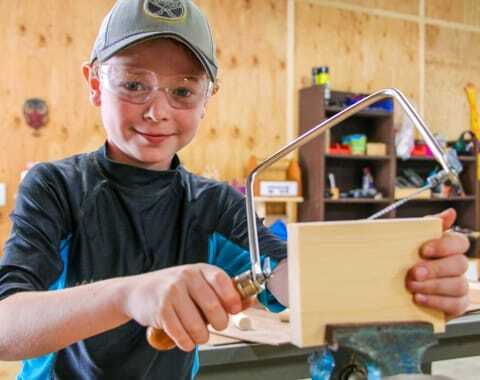 Our Teva department offers an array of electives that include outdoor cooking, archery, fishing, mountain biking on camp trails, animal care (over twenty animals! ), nature crafts, wilderness survival, camp craft, and more. Our trip leaders take younger campers on overnights, waterfall hikes and caving trips and our older campers on multi-day excursions that include hiking on the Appalachian Trail, canoeing on the Housatonic River, and biking in the Berkshire Mountains. The ropes course facilitators offer adventure experiences on our ten element low ropes course, thirteen element high ropes course, three-sided climbing tower, two zip lines, and real rock ledge on Ramah Mountain! Our half acre organic farm offers an amazing opportunity for the camp community to connect with the land on an organic level and learn about agriculture, food justice, environmentalism, and healthy eating. Farm to Table dinners and our fruit tree grove are exciting new additions to the program! 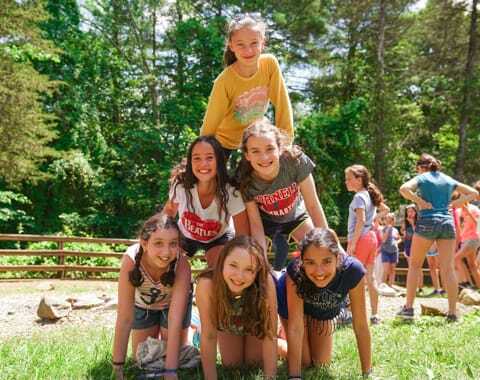 Groups of campers develop an appreciation for nature and learn to bond and cooperate with each other while climbing the ropes course, hiking up Ramah Mountain, working the farm, caring for the animals or doing the dozens of other activities Al Hagova offers.